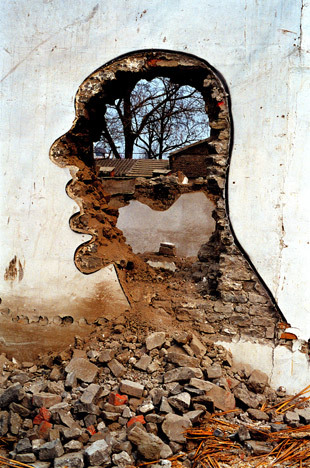 Zhang Dali was born on 1963 and Born in Harbin, China. Zhang Dali has portrayed 100 immigrant workers in life-size resin sculptures of various postures, with a designated number, the artist's signature and the work's title "Chinese Offspring" tattooed onto each of their bodies. They are often hung upside down, indicating the uncertainty of their life and their powerlessness in changing their own fates. According to the artist, immigrant workers who have traveled from the rural areas all over China to earn a living in construction sites in Chinese cities, are the most important members of the Chinese race, who are shaping our physical reality. Yet, they are the faceless crowd who live at the bottom of our society. To cast them in resin is a way to recognize their existence and contribution as well as to capture a fast-changing point of time in the Chinese society. From 2003 to 2005, Zhang has portrayed 100 immigrant workers in life-size resin sculptures of various postures, with a designated number, the artist's signature and the work's title "Chinese Offspring" tattooed onto each of their bodies. They are often hung upside down, indicating the uncertainty of their life and their powerlessness in changing their own fates.You wouldn't notice them in a Western city because the simple drawings would be quickly sprayed over with graffiti done by thousands of other lay abouts, vandals,artists and political groups. But Beijing has almost no graffiti and the heads compete for space only with notices telling you not to park in front of gates or dump garbage, advertisements for venereal disease remedies and the ubiquitous Chinese character - chai, indicating that the building is about to be demolished. In fact, many of 18K's tags are intentionally placed right next to "chai" characters. Not only is graffiti painted onto walls that will soon be rubble unlikely to stir the police into action, 18K also has artistic reasons for associating his heads with condemned structures: the work is an attempt to engage in a dialogue with Beijing, a city where buildings come down faster than they did in wartime Berlin and London.In the late 1980s, 18K was the first artist to move to the village near Yuanmingyuan that later became a thriving colony of artists and bohemians until it was closed by Beijing authorities in the early 1990s. In 1988, 18K was one of several artists featured in independent filmmaker Wu Wenguang's Bumming in Beijing (Liulang Beijin). Conclusions: Zhang Dali has portrayed 100 immigrant workers in life-size resin sculptures of various postures, with a designated number, the artist's signature and the work's title "Chinese Offspring" tattooed onto each of their bodies. View Zhang Dali paintings, biography, solo exhibitions, group exhibitions and resource of Zhang Dali artist. View art online at The Saatchi Gallery - London contemporary art gallery. Zhang Dali. One of Zhang Dali's work.